This is an amazing cheese alternative. It’s made from millet, of course with other ingredients as well. It really tasted as we remembered blue cheese to taste like. 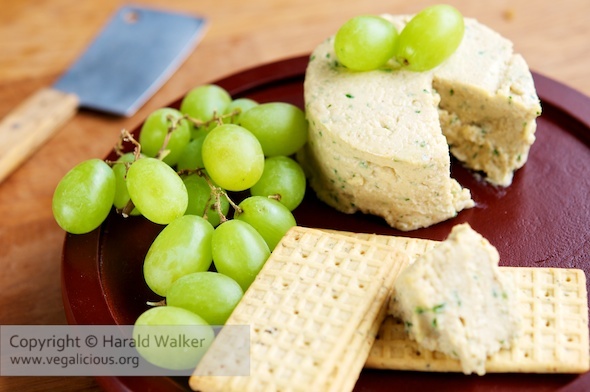 We enjoyed it with lovely vegan crackers and some fresh grapes. Spray 2-3 (depending on size) ramekins with oil, then set aside until “cheese” is ready. Add the chopped cashews and pulse again. Add the tahini, lemon juice and miso and again pulse. Add the seasonings and rest of the ingredients and pulse to blend. We found it to taste just right at this stage. Place 1/4 cup cold water in a small sauce pan. Add the agar agar powder and stir well to mix. Bring the mixture to a boil stirring constantly. Add the agar agar mixture to the cheese mixture and stir well. Pour or spoon the cheese mixture into the ramekins and allow to cool. Place in a refrigerator for 1-2 hours or chilled overnight. To remove from the ramekin, run a knife around the ring, and dip the bottom in boiling water for a 30 seconds, then invert onto a plate or lettuce leaf. We used 2 small baking rings and 1 ramekin as forms. 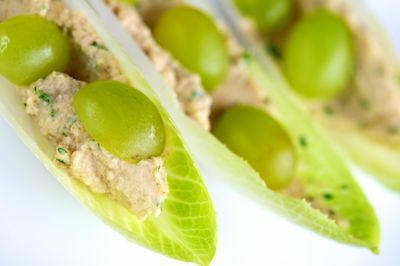 Serve the blue uncheese with Belgian endive and grapes as appetizer or salad. The blue cheese spread can be spread right away onto the Belgian endive leaves. Or if you wish to serve the blue cheese mixture as a solid, then it should be placed in a refrigerator for 1-2 hours or chilled overnight as described before. Cut the bottom off the Belgian endive and separate the individual leaves. Spread each leaf with some of the blue cheese spread. Cut the grapes in half and pace 2 or 3 haves on each endive leaf. Arrange on a platter or individual salad places. Posted by Chris Walker on June 3, 2011 in Appetizers, Belgian Endive, Snacks.